Ever since LeBron James left the only thing significant about Cleveland is that it is one of the stops of the "Best of the Banff Mountain Film Festival." This is an annual spring event that this year takes place at the Ohio Theatre in Playhouse Square on Friday, April 13 and Saturday, April 14. And it ranks as the least geeky film-festival in northeast Ohio. That’s because the Banff Mountain Film Festival is the work of REAL MEN. 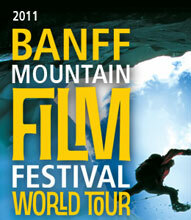 The Banff festival proper originates each November in the Canadian Rockies, as a two-day and four-night expo and trade conference devoted to outdoor adventure and "mountain culture," usually but not always documentaries, submitted by gifted amateurs and total pro athlete-filmmakers of all ages. At Banff, a movie called SALMON FISHING IN YEMEN would be…about extreme salmon fishing in Yemen, not a scripted whimsy about a Scottish fisheries chap in a stagnating marriage hooking up with Emily Blunt and an eccentric Sheikh. At this November frolic the most popular films, shorts and features are voted upon and sent on the road in a “Radical Reels” tour, presenting the cutting-edge in outdoor-ski-cycle-surf-nature-mountaineer filmmaking on the high-energy trails blazed by the likes of Warren Miller and Bruce Brown. In Cleveland a hand-picked assortment of extreme-sports and adventure live-action, animation, sports and features unreel (digitally, anyway) in two different feature-length lineups. Movies start (at 1151 Euclid Ave.) Friday at 7:30 p.m., Saturday night at 8 p.m. But come an hour early for the opening reception, with representatives of area wilderness-sports clubs, parks and "green" businesses. And the inevitable appetizers and Red Bull vendors. ON THE TRAIL OF GENGHIS KHAN: THE LAST FRONTIER – An Australian short feature in which filmmaker Tim Cope, accompanied by his own retinue of horses and a faithful dog Tigon (oh, named for the British exploitation-movie studio of yesteryear, right? No, probably not) takes three years to trek across the huge swaths of lands once dominated by world-class conqueror Genghis Khan, from Mongolia to the Carpathians. Audience members are asked to suppress the urge to yell “Khaaaaan!” in a Shatner voice. Screens Friday night. HANUMAN AIRLINES – Four words sum it up nicely: Paragliding. Off. Mount. Everest. Screens Friday night. REEL ROCK: SKETCHY ANDY – Remember in the Superbowl half-time show this year Madonna cavorted and smooched with a dangling “slackline” dancer in a toga? That guy was a genuine athlete named Andy `Sketchy Andy’ Lewis, whose tightrope stunts here, done between rock outcroppings in desert-canyon locations, aren’t just for pop-star ambiance. Screens Friday night. KADOMA – A short feature following Hendri Coetzee, a legend in the kayak world, in an expedition down the treacherous Lukuga River in the Democratic Republic of the Congo in December, 2010. The epic paddling sortie was destined to turn into Coetzee’s last, in a truly shocking twist. Screens Saturday night. C.A.R.C.A. – Think your housepets are trouble? Behold the activities of the eponymous outfit, whose mission centers on rescuing domestic animals threatened by, of all things, avalanches. Screens Saturday night. JOURNEY TO THE WILD COAST – Forget the marital drama of Lamar Odom and that Kardashian girl, here is the chronicle of Hig Hickman and Erin McKittrick, newlyweds who, in 2008, decided to begin their life together by hiking overland the 4,000 miles from Seattle the Bering Sea and Alaska’s Aleutian Islands. Does Hig leave Erin for Angelina Jolie? Only viewers will find out, Saturday night. REEL ROCK: ORIGINS – OBE AND ASHIMA – Ashima Shiraishi is a nine-year-old Japanese-American girl who is a rock-climbing prodigy, and this film, from the makers of REEL ROCK: SKETCHY ANDY, scrutinizes Ashima and her mentor on a bouldering adventure in Texas. At this rate Ashima could also make history as the very first Japanese who actually somewhat looks and behaves like an adolescent female anime character. Screens Saturday night. In a special this year, the Best of Banff in Cleveland will also welcome a live guest, Dan Austin, an author, filmmaker, long-distance cyclist and sustainability advocate, involved in raising awareness of two-wheeled transport and adventure. www.theedgefilms.com, which posts a complete schedule.